Planting for birds is probably the hardest part of attracting birds to a garden, as it involves hours of hard labour. It usually is not just buying plants and putting them into a hole. It involves the balance between plants, the removal of intruders and the maintenance of the garden to ensure that the plants you have chosen come to their full right and potential. And that is the work after having done all the planning! The true essence of a birders garden starts with planning. Many books will give listings of what the best plants are for birds and how they attract birds, but without planning they may never live up to your expectation. One should realise that planning is required for the short term, but most importantly for the long term, as the plants will grow to maturity over many years. You have to decide on what your end result should be in a planning plane of 5 years at the least, to 25 years at the most. You may have a grass dominated garden with low height shrubs and borders today. 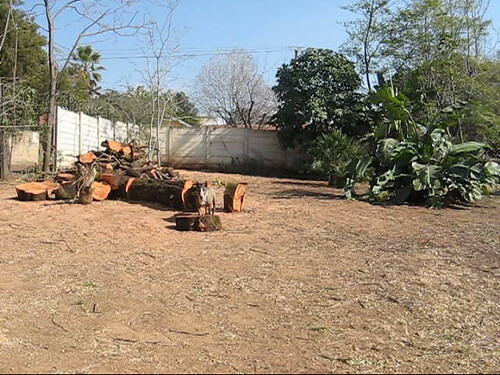 Planting a number of trees and large shrubs will leave you with that view for at least the next 5 years, but soon the character of your garden will turn from grass dominated to wooded. If you did not start expanding borders and planted more shade loving plants, you will soon have some nice trees, but bare lifeless patches underneath them. Similarly if you have a well wooded garden today and you want to keep it so, you have to have a succession plan in place for the mature plants and trees. Yes, most trees will live for a few hundred years, but a garden is a controlled environment and if that tree takes all the light and warmth out of your house by blocking the sun, or your driveway starts lifting up from roots, you will cut down most, if not all of that tree. Without a succession plan and a new tree already in place you will have an empty space for quite some time. Pruning and cutting back needs to be done with discretion. Many of the plants that we want to bear fruit or flowers will not do this if they are pruned back too often. Pruning a bush to keep its shape will probably never allow it to grow sufficient shoots to flower and bear fruit. Once again your planning becomes important so that you plant the correct plant for the space, and allow it to grow to its natural size. plants in proximity as the energy to find food will be far less. Thus create zones within the garden as this will provide dedicated feeding areas with the protection of not having to venture into the open, which is much more appealing to the birds. The advantage to you is a more aesthetically pleasing garden, and you have a better chance of finding the same species in the same spots. My garden pretty much started as a well treed desert. When I moved into my house the previous owners had not given the garden any attention for about 10 years. 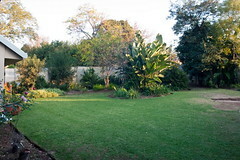 The garden was dominated by a number of very large trees; all of them classified intruders (Saligna, Black Wattle, Privy, Ligustrum and Belhambra). Many of these I had to cut down shortly after I moved in. Under the Wattles I had bare ground with nothing even trying to grow there. 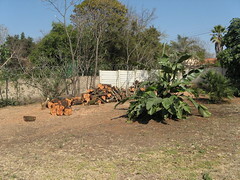 In the three years that I have been in the house I have so far cut down 18 trees, of which two were White Stinkwoods (Celtis Africana) which threatened to crack the foundations of my house. I still have another 10 trees that ultimately have to go, but they are lower on the invader list and as such can remain until the new indigenous trees that I have planted to replace them, have grown sufficiently. 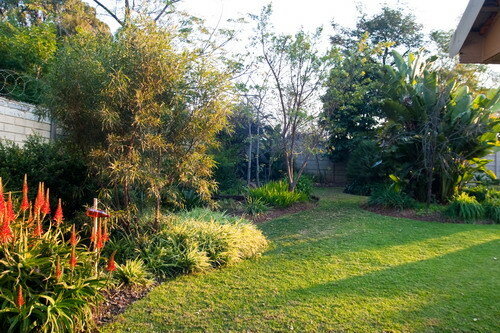 I effectively reduced my garden from sterile woodland to open full sunlight, where many plants now grow. In due time the garden will be transformed back to a woodland, but this time with the right trees in the right places. This was not done without sacrifice and my Spotted Eagle Owl pair and Burchell’s Coucals moved on, but I also gained a few new species such as Black-throated Canaries. In time I will again lose some and gain some as the garden evolves. The one advantage that I did have by having to cut back so much is that I could replan the garden from nothing, giving me the opportunity to put the lessons that I am sharing with you into practice. Now that you have thought about how to plan what do you plant?